The BT Elements 1K digital cordless phones are affordable, while giving you all the freedom you need to take your calls whenever, wherever – with an outdoor range of up to one kilometre! This great environment resistant phone trio-pack allows you to take your calls outside, whether it’s rain or shine. The BT Elements 1K has a huge range, allowing you to enjoy clearer call quality you can depend on – even outdoors! The landline phones are also fully GAP compatible, meaning you can expand your base system with up to two additional handsets (five in total), allowing you to receive incoming calls and make outgoing calls from anywhere within its range! The plastic enclosures are splash proof from any direction and fully resistant to dust. Up to 10 hours of talk time and 250 hours on standby mean these practical cordless phones will never let you down. 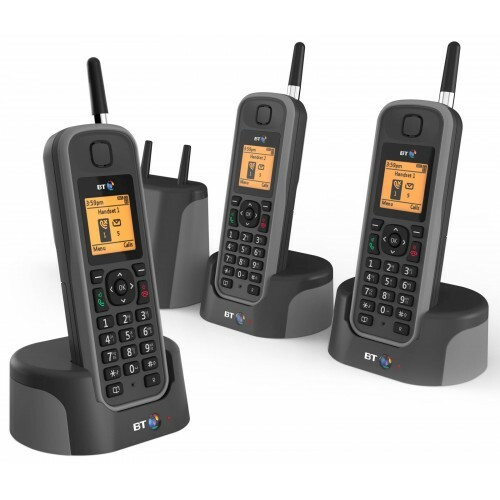 If you're looking for a reliable wireless phone system with easy to use features and a sturdy, weatherproof exterior the BT Elements 1K Trio Pack is a great, affordable choice. Just after a year base stopped working and two batteries don\'t hold their charge. Had these for less than a year and handsets started to stop working or stop ringing. Had some sent back and changed but problem has continued so having to change to a new make and model. shame because range was good and I was hopeful of the robust design. Don't quite get the 1km range that BT claim this phone is capable of but it definitely goes further than any of our previous cordless phones. Overall, satisfied with the purchase: good service, quickly delivery, and decent product. Would recommend. Robust & waterproof. Easy to set up provided you read the setup instructions. Very intuitive to use, hardly ever need to refer to the manual. Download the full manual online (not included in the box). Exceptional range although 1k is probably only under laboratory conditions. The base station being seperate from any phone is a real and unusual bonus because it means you can position the phone anywhere in the house where there is a power supply. If you answer a call without removing the handset from the charger it automatically goes into speaker mode. The volume is not loud and is probably the only downside to report. Overall, I wish I had heard of this phone a lot sooner! It is the best cordless phone I have ever purchased! Odd, when you consider it comes from BT! Not tested the full extent of the range yet but covers our basic needs better than the last BT phones we had so in that respect it's very good!